C&D Technologies, represented by Adilam Electronics , has expanded its range of ac/dc power supplies with a family of modular products that has almost limitless configuration options. The new C&D Technologies Quikflex series will significantly reduce time-to-market while enabling the specification of customised ac/dc power supplies that are fully optimised to individual application requirements. In addition, the flexibility offered by Quikflex allows engineers to accommodate specification changes that may occur during the development cycle without the need for re-sourcing or re-qualification. Providing power ratings options of up to 1000W, the Quikflex series enables users to configure between one and twelve independent, isolated outputs with standard output voltages of 1.45V to 28V. Seven adjustable output modules provide current rating options of 3A, 10A, 12A, 15A, 20A, 30A, and 80A. In addition to rapid production turn-around, time-to-market is further reduced by the fact that each delivered unit conforms to EN61000-3-2 for power factor correction and comes with full CE and UL approval. The Quikflex range of configurable ac/dc power supplies is based around a 2-transistor forward converter front end with planar magnetic main transformer technology and modular magnetic amplifier output stages. All units feature a universal voltage input and have input/output dielectric strength of 3000V ac. Products in the Quikflex family require no minimum load and provide line and load regulation of ±0.1% and 0.2% respectively. Ripple and noise performance is specified as the greater of 1.0% or 100mV peak-to-peak. Protection for overcurrent, overvoltage and overtemperature conditions is standard, while remote sense functionality is also a standard feature on single-output modules. Configured Quikflex power supplies use industry-standard, compact 4-slot or 6-slot extruded aluminium packages. Power connections are via screw terminal connections. Primary and secondary controls enable power channels to be individually voltage adjusted or enabled. In addition, these controls allow engineers to connect Quikflex modules in parallel or series to provide almost limitless power, current and voltage configurations. 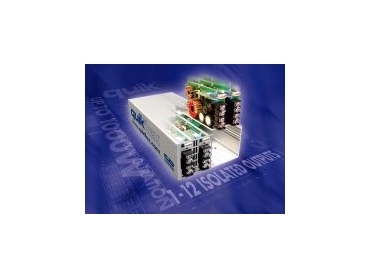 Four-slot Quikflex AC/DC power supplies have dimensions of 270 x 127 x 65mm. Six-slot versions measure 270 x 187 x 65mm. Operating temperature for all units is -20°C to +70°C.